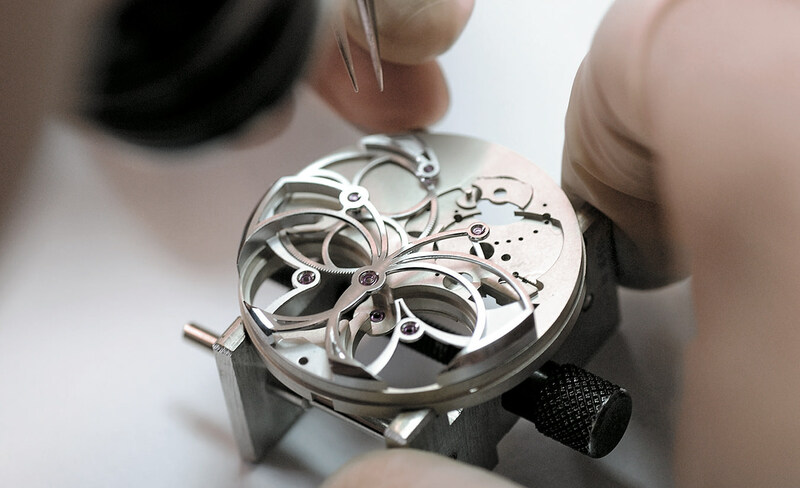 The Opus 7, designed by Andreas Strehler in the shape of a butterfly. Nobody knows what to expect because no Opus is ever like any that has preceded it. Nor, indeed, quite like any watch of any kind that has come before. In the deeply traditional world of mechanical watchmaking, brands tend to develop their models at a speed more akin to biological evolution than modern product design. Opus is anything but traditional; indeed, it has played a leading role in kick-starting the 21st century’s new wave of radical watch design. 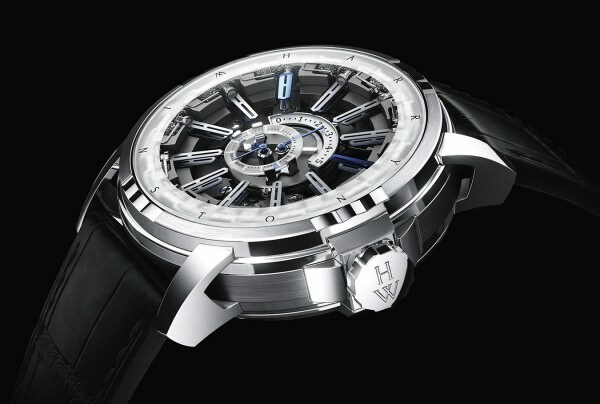 As Frédéric de Narp, who is CEO and president of Harry Winston and directly oversees its timepiece division, explains, the principle of the project since it was instigated 12 years ago is to “identify the world’s most talented and innovative—and often least-known—watchmakers with whom to begin an adventure based on co-operation.” The independent watchmakers and Harry Winston’s craftsmen and designers work symbiotically, in what de Narp describes as a “human journey”. The result has been a series of audacious and meticulously executed pieces—and the company’s reputation in haute horlogerie is becoming as dazzling as the diamonds that have brought it such fame during the past eight decades. Take this year’s Opus 12, created by Emmanuel Bouchet. Two years in development, it turns the conventional rules of indicating time inside out: rather than placing a pair of hands at the centre of a dial, Bouchet set 12 pairs of hands around the circumference, pointing to the centre, and did away with a conventional dial. It’s a work of staggering technical complexity, and watching it in operation is compelling: the hands flip, in succession, at five-minute intervals to show a blue-coloured side. Then, at the change of each hour, the entire watch face becomes animated, the movement executing an elaborate and beautifully choreographed drill with the successive rotation of all 24 hands. The Opus 12 by Emmanuel Bouchet, released in 2012. To understand Opus requires looking back to 1989, when Ronald Winston introduced fine timepieces to the jewellery company founded by his father, Harry. Technically complex watches were always part of the plan, and one of the first was a Double Retrograde Perpetual Calendar. (The Premier collection, to which it belonged, remains emblematic of the brand to this day.) By the end of the 1990s, however, the timepieces division was in trouble. Opus 1 caused a sensation. Journe’s dual time-zone Resonance Chronometer was the first wristwatch movement ever to feature two balances synchronized by the natural phenomenon of resonance. Conversations about the Harry Winston brand changed almost overnight. “To me, Max’s [Maximilian’s] basic concept with Opus was fantastic,” says Christophe Claret, the creator of Opus 4. “Approaching me with the idea of making a watch together and asking me, simply, what it was that I wanted to do more than anything else—that was a first in watchmaking.” In this context, de Narp’s assessment that “an Opus timepiece is a watchmaker’s dream come true” does not seem fanciful. Some Opus pieces appear relatively classical (housed in adaptations of the Premier case), even while playing fast and loose with notions of the possible in a watch movement. Opus 2, a collaboration with watchmaker Antoine Preziuso, was a tourbillon with a perpetual calendar on the reverse side. Claret’s Opus 4 was both aesthetically restrained and technically extreme: a fully reversible watch with back-to-back dials and hands moving in opposite directions, together with a tourbillon, the date and moon phase, and the minute-repeater striking on cathedral gongs—the latter a world first in a wristwatch. The poetically pleasing Opus 7 is Andreas Strehler’s take on a highly complicated watch made to look extremely simple—after several thousand hours of work. Some have torn up the rule book with iconoclastic styling and extraordinary internal architecture. For Opus 5, Felix Baumgartner’s three-dimensional structure for measuring time marked off the passing hours with a series of tiny numbered cubes that spun on two axes and revolved like a satellite. For Opus 8, Frédéric Garinaud, neither a watchmaker nor a designer by trade, brought together complicated mechanics and digital electronics in a case that resembles a vintage television set. Opus 9, by Jean-Marc Wiederrecht and Eric Giroud, was equally radical: by using a chain of diamonds not for decoration but as a functional element of time-telling, it is a brilliant expression of what a jewellery house’s watch can be—or perhaps should be. It won the Best Design Watch at the 2009 Grand Prix d’Horlogerie de Genève, the Academy Awards of fine watchmaking—a remarkable achievement for a brand that barely registered in the high-end watch segment a decade ago. But perhaps more than any, Vianney Halter’s Opus 3 blew apart the classic image of a fine watch. With its whimsical case design that incorporates six small portholes through which the digital time and date indications can be read, and a radically different mechanism, where the time and date numerals are marked on a series of 10 tiny stacked discs that rotate independently from one another, it took 18 months to develop and required 98 per cent of the movement parts to be designed from scratch. Fifty-five collectors paid deposits for the watch when it was revealed in 2003. Their faith was rewarded at the end of 2009, when they finally received their watches; the movement had required some radical reworking to make it function fully. When Büsser left in 2005 to set up his own firm, MB&F, there was talk of the Opus project being wrapped. However, it seems to his successor, Hamdi Chatti, that the momentum gained for Harry Winston as a whole—and for a new approach to watchmaking—was too valuable to waste. With only six months before he had to present a new Opus at Basel, Chatti called on Robert Greubel and Stephen Forsey. Within days they had agreed on the 30-degree double tourbillon; six months later, they had a finished prototype. Some grumbled that it wasn’t extreme enough, but the passing of time has been the better judge: at Christie’s auction of eight Opus pieces in Hong Kong in May, Opus 6 fetched the highest price of the collection, at $375,313 (U.S.); in second place, well behind, was Opus 5 at $204,514 (U.S.). The Opus 6, developed by Greubel Forsey. The essence of all of these watches is that they offer new, different, and beauteous ways of telling the time, each one of them an enthralling kinetic sculpture that expresses a singular vision. The achievement of Opus is monumental—not only has it had a profound impact on Harry Winston, it has changed the way high horology is perceived. “The Opus timepieces … due to their groundbreaking nature … have contributed to establishing Harry Winston’s legitimacy within the world of high horology,” says de Narp. This, in turn, has strengthened the company’s nine other watch lines—and the bottom line of the business as a whole. That is not to say that Opus is seen as a testing platform of ideas for the company. “Opus is central for us, but it is a unique project and is not incorporated into the main lines,” says de Narp. However, the legitimacy that Opus has brought to Harry Winston timepieces is reflected upon all of the main collections, from the groundbreaking Zalium watches of Project Z to the Ocean and High Horology collections. 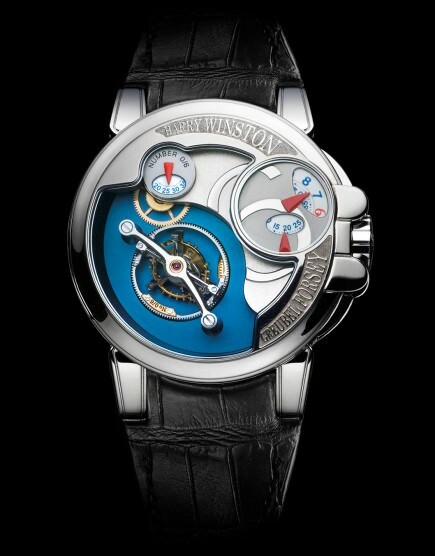 David Gouten, Harry Winston’s vice-president of sales, estimated in an interview with the Financial Times last year that “80 per cent of the success of Harry Winston watches today can be ascribed to the Opus effect.” According to the same report, in 2001, the company sold 800 watches, with a total value of $13.7 million; a decade later, the figures were 4,000 to 5,000 pieces, for a total value of around $105 million. Beyond the company that created and supports it, the project has had a profound impact on the status of watchmakers: at the end of the last century, they were, in Maximilian Büsser’s words, “really not valued according to their worth.” The watch companies saw them as merely suppliers—and thus saw no reason to name them. Now that independent watchmakers are celebrities among aficionados of the watch world, it’s hard to imagine the enormity of placing the name of a craftsman on equal footing with that of a major brand a decade ago. Today, leading watch brands besides Harry Winston seek collaborations with these watchmakers—it was Wiederrecht who created Van Cleef & Arpels’s dazzling Poetic Wish series, for instance. And there’s a whole subset of Opus alumni, with their own brands making super-niche, eye-wateringly complex limited editions, among them Greubel Forsey, Felix Baumgartner’s Urwerk, and Jean-François Mojon (Opus 10) at Chronode. Even within Harry Winston, the Opus effect has been felt. Denis Giguet had been head of production there during the period from Opus 1 to Opus 6, by which time the changing environment of watchmaking gave him sufficient confidence to strike out on his own; he was invited back to create Opus 11—a work of jaw-dropping pulchritude and complexity. Hamdi Chatti is now leading Louis Vuitton’s very well-funded and ambitious timepiece division—and, of course, there’s Büsser himself.